Stunning 4 bed (optional 5th), 3 bath home in the heart of Del Sur! Wonderful family friendly neighborhood with pool and park access! 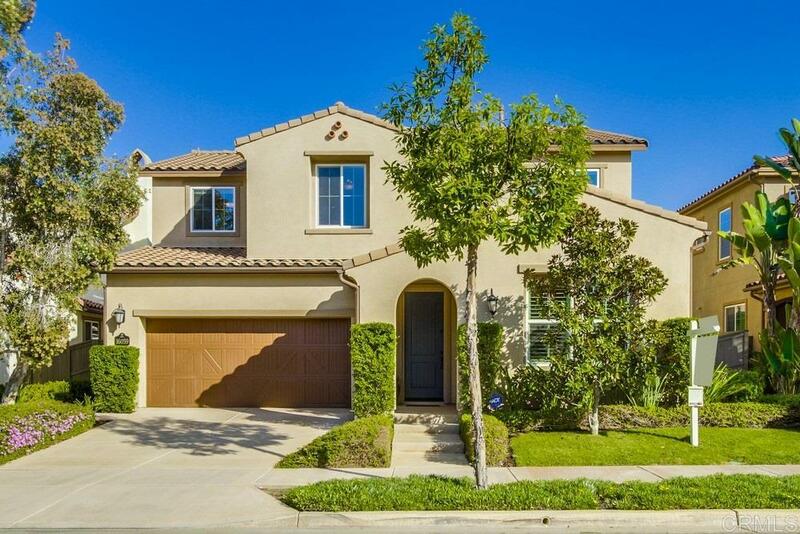 Walking distance to Del Sur Elementary and eligible for Poway Unified Schools! Open and bright floor plan with beautiful upgrades. Enjoy first floor living with guest room and home office on the first floor. Large and spacious loft upstairs, and a private and peaceful Master Retreat! Convenient location close to everything you could need!, GORGEOUS Plan 2 Carleton in the heart of Del Sur. This 4 bed (optional 5th), 3 bath home boasts a fantastic open and bright floor plan that you will immediately fall in love with. The first floor features a beautiful bedroom as well as a full bathroom with shower and sink vanity with custom tile backsplash. Stunning upgraded hardwood flooring throughout the first floor with plantation shutters throughout adds to the clean, modern feel of this beautiful home. The lovely formal dining room, with access to butler's pantry with built-in wine fridge, allows for the perfect opportunity to host family and friends for dinners or parties! Enter the chef's kitchen with beautiful granite countertops, espresso cabinetry, a large center island with barstool seating, and upgraded stainless steel appliances including double ovens. Ample amounts of cabinet and countertop space will make cooking and entertaining a breeze! The kitchen connects seamlessly to the breakfast area and the generously sized family room. This area features vaulted ceilings, multiple windows which provide brilliant natural light, and a gas burning fire place! This is a warm, cozy room to relax with friends and family. Adjacent to the breakfast area is the home office space with custom built in desk, storage and shelving. Upstairs enjoy the spacious and private Master Retreat with large windows mirroring the backyard that provide bright, natural light. Custom built in cabinetry and storage leading into the master bath helps to stay organized. The modern bathroom features tiled flooring, separate vanities with custom tiled countertops and backsplashes, an oval soaking tub, and large spa like shower with tile inlay and built in seat! The huge master closet provides more options for organization and storage! Upstairs you'll also find a vast loft which is a great option for a kids play place, entertainment room, second office space, and more! 2 additional bedrooms with full closets and ceiling fans share a full bathroom with dual sink vanity with white cultured marble countertops and shower/tub combo. Outside you'll find the private, covered Del Sur room with custom tile, outdoor TV and fireplace! This is an amazing space you can enjoy any time day or night. The delightful backyard also features a custom built in grill and flagstone seating area that makes this the perfect place for entertaining, This backyard also has a second, tiled patio space for outdoor furniture, perfect to soak up the California sunshine or dine outside al fresco! The grassy lawn area is perfect for kids and pets with plenty of lush greenery surrounding which adds privacy to this quiet, serene outdoor space. This home also offers a finished garage with epoxy flooring and overhead storage that allows ample parking for two cars. This home in AMAZING Del Sur is in a family friendly neighborhood that is extremely sought after. With community pools, and parks and community events which enrich the lives of all Del Sur residents this is a chance for you to have the place you've always wanted to call home. With a great location close enough to walk to Del Sur Elementary, a California Distinguished School and National Blue Ribbon winner as well as the ground breaking Design 39 campus just minutes away. You're also close to other award winning Poway Unified Schools like Oak Valley Middle and Del Norte High. The convenient location is also just a couple miles from everything you could need! The Del Sur Town Center and 4S Commons Center are less than 2 miles away, where you can find grocery stores, shopping, restaurants, gyms, coffee shops, and more! Never run out of food options with 65 restaurants within 5 miles. Take advantage of the famous Southern California climate with 28 golf courses, 24 parks, 4 dog parks and 3 hiking reserves all within 10 miles! You just can't beat this home, upgrades, and location! Brought to you by the Butler Gore Realty Group.